A recommendation from Josh Judkins. LEFT: result of my original design. | RIGHT: what it was meant to look like. 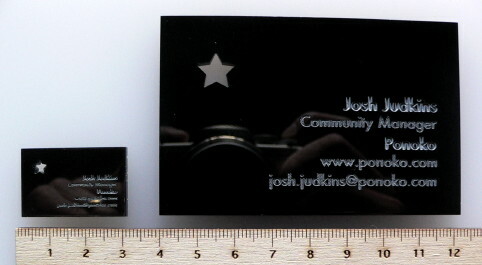 Yes that's right - I managed to make a TINY unreadable business card (about the size of a Mahjong tile) as a result of using the wrong Units when I was designing it. Suffice to say, Pixels do not equal Millimeters. I console myself that this age of rapid prototyping and digital manufacturing allowed me to discover my mistake quickly and with minimal expense. Not like the $327.6 million which went down the drain due to improper Unit conversion with the Mars Climate Orbiter. However, I could have easily spotted the mistake before even uploading my design. I now know that I could have prototyped my design at (virtually) zero cost to myself, using equipment available in my own home. I could have printed out my design on paper. 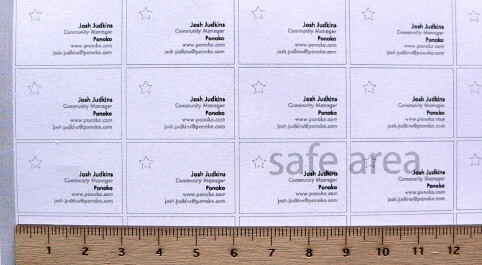 Print it out at 100% scale and make your first prototype FREE. All good? Jump back to myPonoko. Did you need to make some adjustments? Upload your updated design. I used a razor to cut out holes in the paper where the laser would cut to see if my components would fit through. It turns out that paper is very forgiving - so when my design came, my holes were less than a millimeter too small, and I hadn't caught it because the paper wasn't as rigid as the acryllic. I did not take the thickness of the material into account (doh!) So while the interlocking parts fit on paper, I was approximately 3mm off in my initial design. Thanks for providing these additional tips Jay - a great follow-up to the original post! I always do this when designing PCB layouts, printing on paper and then making sure the components etc have clearance or whatever else I need to check. So far, I have yet to make a finished board where there was a clearance\size error, as I've picked any up during the tests on paper. I think it turned out the footprint for the USB port had actually had the pad numbering done wrong. Thanks for the tip, Agent 24! I hadn't thought about using this same idea with PCB layouts, but of course it would work just the same (if not be even more important). I use Inkscape, and it's very difficult to print from it. Any suggestions?